Three words to describe The Abominable Dr. Phibes: elegant, macabre, and…fashionable. Master of horror, Vincent Price, is devilishly captivating as Dr. Phibes, a man insane from the weight of grief. With its surreal art direction, dark humour, and surreal tone, The Abominable Dr. Phibes is a wonderful (if sometimes overlooked) piece of horror cinema. Vincent Price is brilliant as Dr. Anton Phibes. The Abominable Dr. Phibes is a very entertaining horror. It succeeds because it embraces its own eccentricities and fleshes them out with dark comedy. We revel in the gruesome delight of seeing how Phibes appropriates the ten plagues of Egypt, the dark humour letting us in the on the joke and freeing us from the moral obligation of finding him monstrous. But it isn’t just the comedy that allows us to do this. Vincent Price’s performance as Anton Phibes is one he injects with genuine pathos. Hardly saying a word, so much is communicated through Price’s piercing blue eyes, and Price extracts a great deal of sympathy from the audience – despite his grotesque endeavours. His eyes alone carry a great sadness that eats away at you. You might not condone sending a plague of locusts to eat someone alive, but you certainly find yourself thinking what you’d do if you lost the person you care most about. There is a part of oneself that can’t help but feel for Phibes – and that’s a testament to Vincent Price. Price’s striking blue eyes sell the soul of Dr. Phibes. Price uses his face wonderfully. 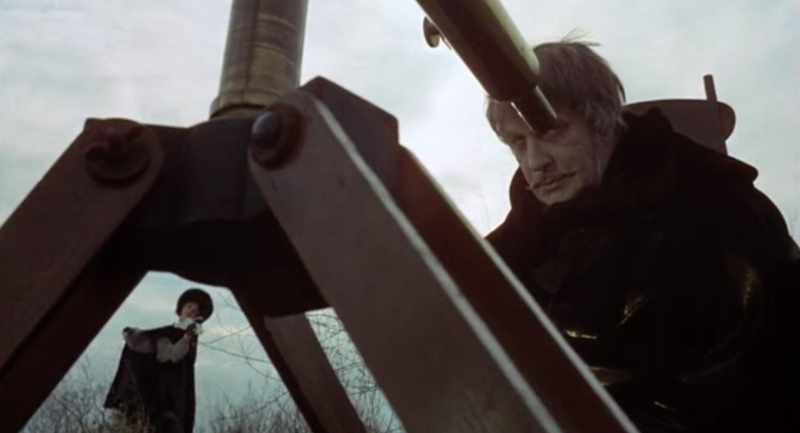 Anton Phibes’ face, or at least what we think is his face, is not what it seems. Complemented by the unsettlingly waxy makeup, Price’s calculated facial movements genuinely sell the idea that we’re looking at someone speaking behind a crude imitation of a face. 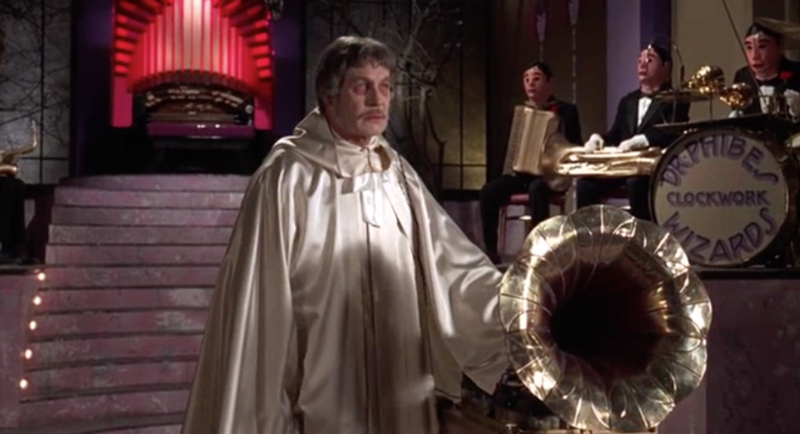 When Phibes speaks, we’re treated to Price’s iconic voice delivered in a staccato manner and projected through a gramophone. These elements combine to construct a mystery of a man, building up what we think Phibes must really look like if he’s forced to speak and move as he does. 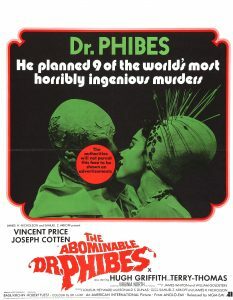 One of the film’s release posters teased Phibes’ real face and gleefully exclaimed that “the authorities will not permit this face to be shown on advertisements” I’ll comply with “the authorities” and simply advise that you see the film to enjoy (or be horrified by) Phibes’ visage yourself! The eccentric British poster for the film’s release. Peter Jeffrey and Joseph Cotten (as Inspector Trout and Dr. Vesalius, respectively) perform well as the supporting cast. Peter Jeffrey is reminiscent of Harry H. Corbett’s DS Sidney Bung from Carry on Screaming (1966), whose stiff-upper-lip Britishness allows for some brilliantly matter-of-fact line deliveries. Joseph Cotten, best known for his work with Orson Welles, gives a subdued performance, but is roused to an effective intensity in the film’s third act. The film’s visuals are often gorgeous as shots linger and shift focus over the grand sets. The camera work complements the art direction, whose surreal sets help to realise Phibes’ madness. The neon-pink organ that Phibes’ plays sits in contrast to the art deco orchestra that it rises to join. It’s something that initially feels out of place, yet that same quality makes it mysteriously alluring – like Phibes himself. Phibes presides over his art deco orchestra. 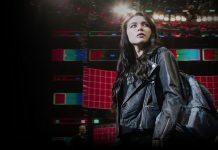 The only thing that disappoints is the film’s pace in the second act. As the police discover the pattern of the murders, a lot of the mystery is withdrawn and the pace with it. 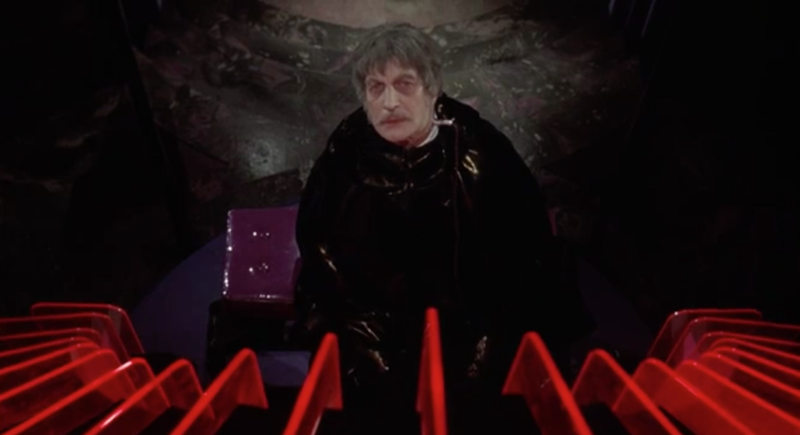 Instead, it becomes a search to find out whether or not Phibes is still alive. As entertaining as that is, it doesn’t match the morbid fun that comes with knowing that Phibes is getting away with murder undetected as the police struggle for an answer. Despite the occasional slow pace, this remains a wonderfully entertaining film. This is a macabre and mysterious piece of horror cinema, at once grotesque, tragic, and funny. 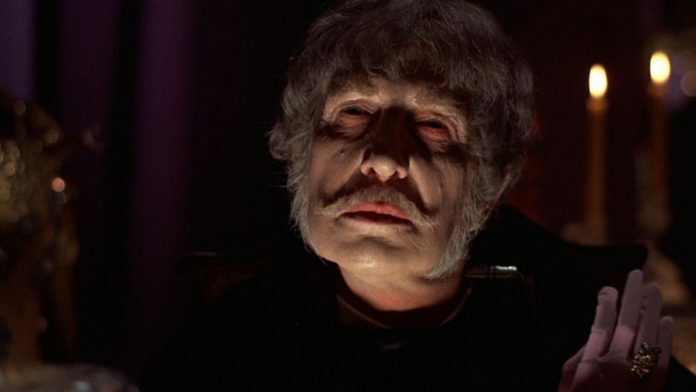 Vincent Price is marvelous as the titular doctor and, in this critic’s humble opinion, Dr. Anton Phibes stands as one of his best roles. The dark humour keeps the film from ever taking itself too seriously, and that arguably allows you to enjoy it more closely, settling in to a ghoulish experience without the sometimes-pretentious act of explaining it all away. Whether you’re an interested horror fan, or discovering The Abominable Dr. Phibes through its affectionate inclusion in 2017’s The Big Sick, it’s a wonderful horror to see.